In a search for the quintessential Australian band, Mental As Anything have to be considered one of the prime candidates. Without ever referring to an Australian icon or landmark, their songs still carried images of an Australia and an Australian attitude to life we can relate to. They met at art school and, in 1976, decided to form a band, and arrived for their very first gig unnamed. The promoter chose Mental As Anything. Shortly afterwards Chris O’Doherty’s brother Peter joined to complete the line-up which would remain intact without a change twenty plus years on. The first gig with the completed line-up was at Sydney’s Cell Block Theatre on August 17, 1977, the day Elvis Presley died. On the way Chris O’Doherty had become Reg Mombassa; Martin Murphy, Martin Plaza; Andrew Smith, Greedy Smith and David Twohill, Wayne Delisle. The performances which turned the band’s career around happened during a residency at the Unicorn Hotel, a small inner suburban pub; so small, legend has it the band was forced to play from on top of the hotel pool table; so small the band quickly had to search out other places to play as soon as the Unicorn could no longer cope with the size of the crowd the Mentals were attracting. Amongst that crowd were filmakers Cameron Allen and Martin Fabinyi who were so in love with Mental As Anything’s music they started their own record label, initially just for the Mentals music. Martin’s brother Jeremy Fabinyi took on the Mentals’ management. The first Regular Records release told it like it was – a three track EP called ‘Mental As Anything Play At Your Party’. Mixing their own songs with old Monkees hits and the latest New Wave rock by the likes of Wreckless Eric, the Mentals were the ultimate party band. They were as cool as Radio Birdman, playing at a pub nearby, just fun. The band managed to sell 1100 copies of the EP from the boot of their car, and Double J started playing one of the tracks, ‘The Nips Are Getting Bigger’, an ode to looming alcoholism. Festival Records took over distribution of Regular and released a remixed ‘The Nips Are Getting Bigger’ as a single, quickly followed by the first Mentals album ‘Get Wet’, with Cameron Allen the filmaker-turned-record company exec now producing. ‘Get Wet’ was full of quirky, well-crafted neo-pop songs penned by the group’s four songwriters. ‘Nips’ became the group’s first national hit, and when Virgin released ‘Nips’ in the UK it made #1 on the alternative charts. The singles that immediately followed ‘Nips’, and the second album ‘Expresso Bongo’ (named after a Cliff Richard movie) did not repeat the initial successes. The Mentals were trying to be too quirky, at the expense of their greatest assets, their songs, and their pop sensibility. It took the fourth single, the straightforward ‘Come Around’, to return the group to the charts. They followed with a non-album version of the 1964 hit by the Reflections, ‘Just Like Romeo And Juliet’. The Mentals weren’t doing anything they hadn’t always done, but that song focussed the band and the audience on what it was about. Suddenly everyone “understood”, and from now on Mental As Anything’s future was assured. With four competing and interchangeable songwriters the Mentals have never been short of material or inspiration. At different times different members have shone, with the rest close at their heels. This early period belonged to Martin Plaza. He’d written ‘Nips’ and Martin now also came up with the definitive, comically tragic ‘If You Leave Me Can I Come Too?’. Greedy Smith provided the follow-up, ‘Too Many Times’. The new production team of Bruce Brown and Russell Dunlop realized the Mentals’ pop potential and the ‘Cat And Dogs’ album became a national #3 seller. In June 1982, during a tour of Australia, Elvis Costello was moved to produce the single ‘I Didn’t Mean To Be Mean’, again by Plaza. The rest of the world was now beckoning also. A compilation album was released in the US and Men At Work, at the peak of their popularity with bands prepared to pay to support them, insisted that Australian bands including Mental As Anything were given the job. For the next few years the Mentals’ flirtation with the international market continued, while at home in Australia their fortunes were unusually driven by the fortunes of their singles, although the albums were always full of extra pop gems. 1985’s happy-go-lucky Australian #1 hit ‘Live It Up’ (by Greedy Smith) was as close as they came to a major international success, #3 in the UK, and a hit around Europe. It was also included on the ‘Crocodile Dundee’ soundtrack. Throughout their musical journey the former art students kept up their involvement with art, and used their rockstar notoriety to draw attention to joint exhibitions. During at least one of his Australian tours Elton John was one eager buyer. Reg Mombassa also started his influential personality-stamping association with the Mambo Clothing company. The apathy which greeted the band’s seventh studio album ‘Cyclone Raymond’, from the band’s point of view an attempt to change things a bit, and a horse-riding accident suffered by Greedy Smith which kept him from performing, combined to encourage the group to take a break for a while, and pursue individual projects. Solo albums. Splinter groups. The next proper Mentals album didn’t arrive until 1995 with ‘Liar Liar Pants On Fire’, as the title suggests, the group still at their cheeky, cheerful best. By now the Mentals were completely independent of the mainstream music industry, handling all their own business affairs, producing, as well as (obviously) designing their own record covers and writing and performing the songs. They’re also one of the few bands who have retained ownership of their back-product through various shifts between record distributors. On August 16th, 1997 they celebrated 20 years together with the same line-up by playing a free birthday show at the Hopetoun Hotel in Sydney, giving birthday cake and other strange prizes to the audience that squeezed in. Their 21st anniversary was celebrated with the release of another album. ‘Garáge’. 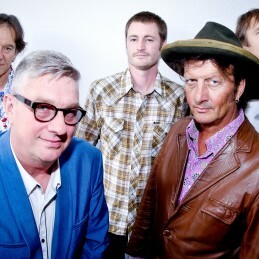 In April 2001 Mental As Anything announced the first official change to their line-up since the band was formed in 1976. With Peter O’Doherty and Reg Mombassa occupied with their respective art careers David ‘Duck’ Barraclough (The Exponents) and Murray Cook (Leah Purcell, Mixed Relations) officially became Mentals . Barraclough and Martin Plaza penned the April 01 single, ‘Fine Line’. A further line-up change occurred in 2004 when drummer David Twohill departed was replaced by Robbie Souter, a veteran of the Dynamic Hepnotics. In late 2007 Twohill successfully took the band to an industrial commission for wrongful dismissal. In the meantime the group had released ‘Songs the Lord Tortoise’ (recorded 2003/4 but never released, favourite covers from the early days) and ‘Plucked’, an acoustic album of earlier songs.